The Puffer Mouse is a breed of mouse found in the Sunken City. It is known to drop a variety of loot. Consisting of extremely elastic skin, the Puffer Mouse can easily fill its body up with surrounding water and puff up to a much larger size. This defence mechanism is great for thwarting potential predators but it also is an attractant to hunters who, for a long time, were fooled into thinking they were much heavier mice than they actually are! The Puffer Mouse has no specific preference for any kind of cheese. The Puffer Mouse is susceptible only to Hydro weapons. It can be found in the Oxygen Stream, School of Mice, Sea Floor, and Shallow Shoals zones while on a Dive in the Sunken City. The Puffer Mouse drops the Bubbling Egg, the Mouse Scale Egg, the Oxygen Egg, and the Salty Sea Egg during the annual Spring Egg Hunt. 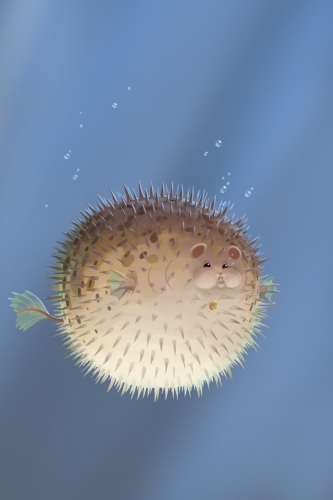 The Puffer Mouse was released 2 July 2014 as part of the Sunken City content. This page was last edited on 1 March 2018, at 09:46.